Anatomy of a solo trip, day six. All done. 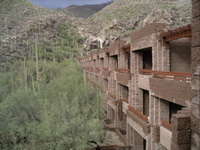 Due to high waters in the nearby canyons, we do loops around the hotel instead of going out to do a breakfast hike. We end up eating near a waterfall. 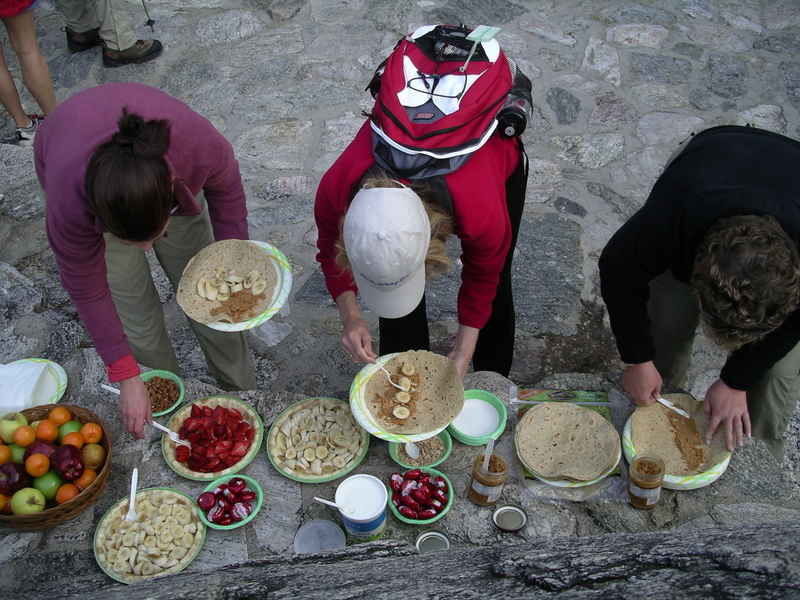 Since this whole trip is about healthy eating, breakfast "on the trail" consists of fruit, peanut butter, cottage cheese, fruit, whole grain tortillas, nuts, fruit and more fruit. Good eatin' in a beautiful setting. Though Tucson winter mornings are a tad chilly. We scurry to get a final hike in. 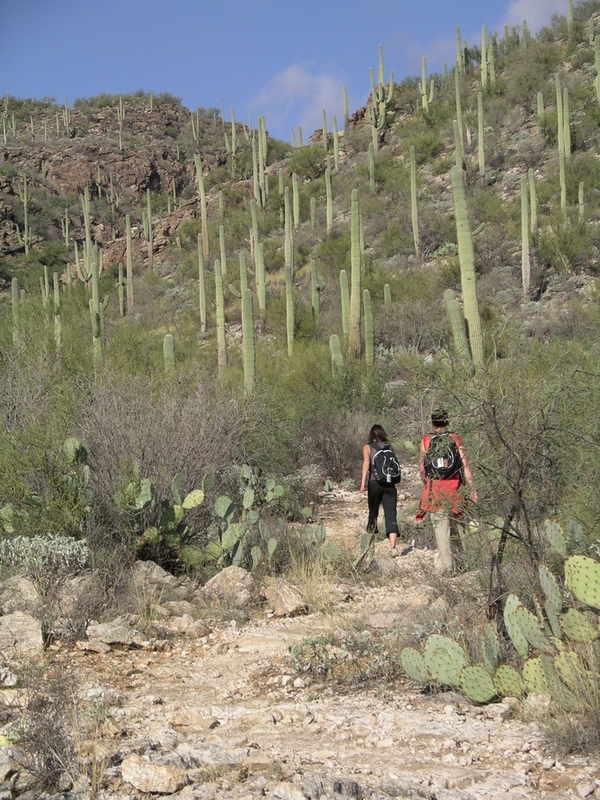 And are rewarded with another great sunny day among the saguaro cactus in Sabino Canyon. Last night at dinner in an Italian restaurant, we received silly awards. Things like the roadrunner award for fastest hiker; the "pushing your personal limits" award for someone who'd never done this kind of hiking; and the most dedicated "spa-er" for someone who dropped out of one hike for a mani/pedi at the hotel spa. She had also come alone on this trip, leaving behind her husband and 14-year-old daughter. Anatomy of a solo trip, day five. Pain. 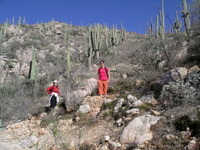 I wish it hadn't taken me slamming into a prickly pear cactus to make a great point about traveling solo, but it did. Here's the sad tale. 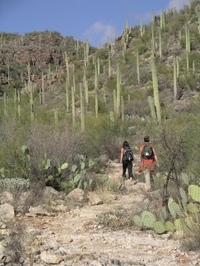 In heavy hiking boots, on a trail marked "difficult," I tripped and pitched forward. Under normal circumstances I think I would have been able to right myself. 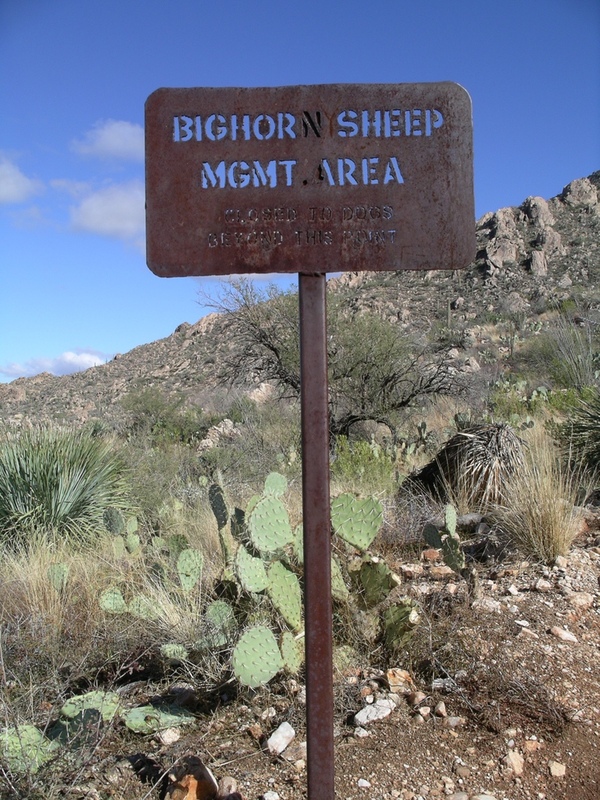 But with boulders planted on the trail, I kept misstepping, never getting my feet under me, until I took the header into the big green vertical bed of needles. A "sider" actually. I finished the spill with my back leaning on the cactus. Ouch, ouch ouch ouch ouch...and a hundred more ouches. That's the sound of someone having many, many hair-brush sized needles pulled out one at a time from arms, legs, back and other more interesting places. By me, and both my hiking companions. Anatomy of a solo trip, day four. Laughs. Bridget, a fellow hiker, had some of us laughing all morning, after she showed us the "Michigan mitten" at breakfast. Someone asked her where she grew up and she held up her right hand and pointed to one side of her palm. "Right here." Huh? Apparently, Michigan children learn that their state is shaped like a giant hand, or mitten. And they locate their cities on their own palms. Bridget showed us Kalamazoo, where she grew up, and then traced a line with her index finger to Ann Arbor and on to Detroit. She seemed surprised we didn't know about the mitten. Or else she has a very dry sense of humor. Either way, she had us in stitches. 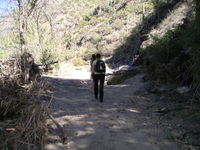 After breakfast, I had a peaceful morning hiking by myself in the northern part of the Santa Catalina Mountains. Well, not totally by myself. It's not a trail I would have braved on my own. Too many risks for a once-in-awhile hiker from out of town to attempt solo. But with people from the group ahead and behind, I felt secure. When the eager hikers set a brisk pace behind the lead guide, I dropped back so I could be on my own and walk at my pace. Anatomy of a solo trip, day three. Rain. 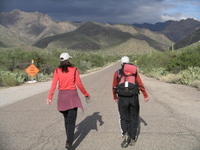 Yesterday's hail dusted the mountaintops here in Tucson, changing the desert palette. By this morning it was raining. If I had been out West hiking on my own, I might have spent a lonely day in my room, or hanging around the hotel, today. Maybe I would have gone shopping or to a movie. But I'm not here alone. I'm with a dozen plus other people I now know. I enjoy their company. And now that we've gotten the "where are you from, what do you do," conversations out of the way, we've moved on to more interesting topics, like religion, adoption and how great the masseuses here have been. I come and go as I please. 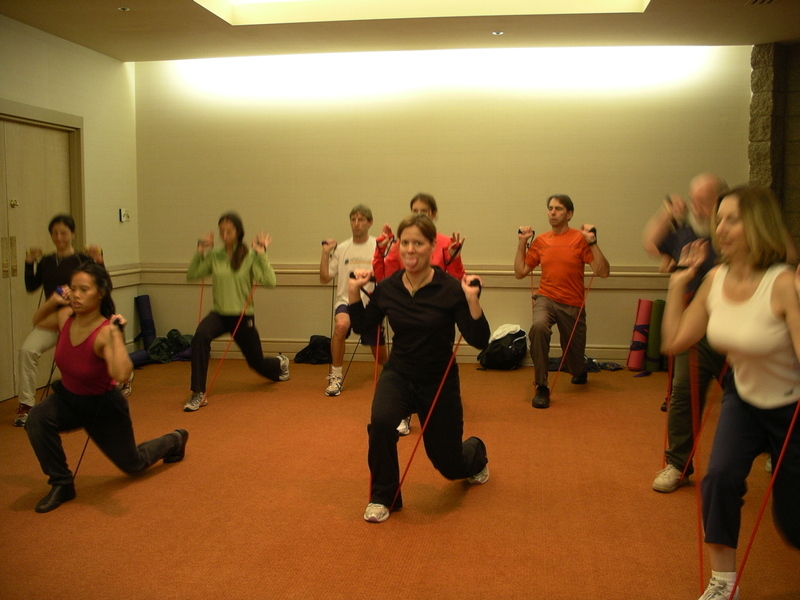 This morning I skipped the group exercise circuits at the gym because a nap was more appealing. When I was ready for activity and company, I joined the others for lunch. And then for an afternoon strength class. 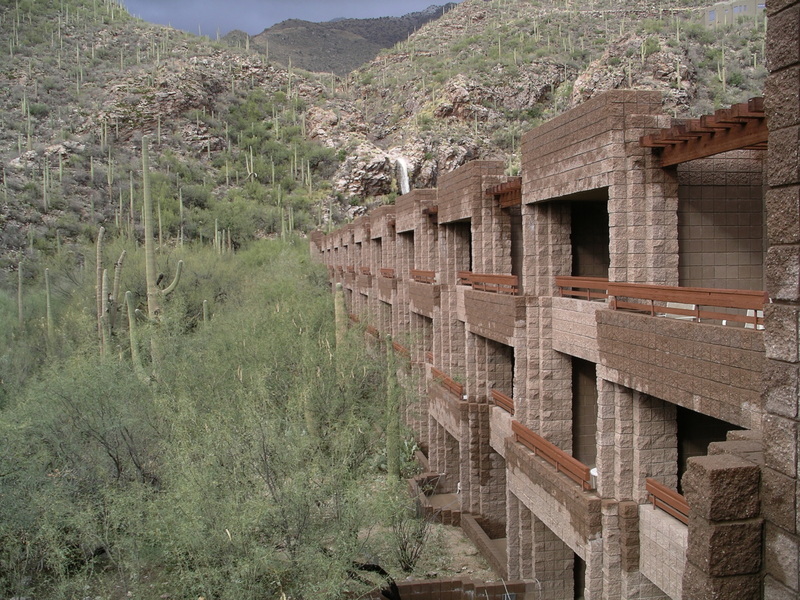 That's the point of this hiking spa vacation, says Devon Metz, the owner. "You can focus on yourself, but you also have this group camaraderie." In other words, indulge at will. In massages, classes, meals and friendly company. Or wander off on your own when you'd like. Anatomy of a solo trip, day two. Hail. A loud, heavy hail storm has left quarter-inch balls of white ice on the hotel's lawns and sidewalks. An old water tank for cattle, which are no longer allowed where we're hiking, is filled with plump, healthy goldfish. Goldfish! 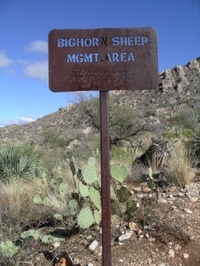 In the Sonoran Desert in Arizona. 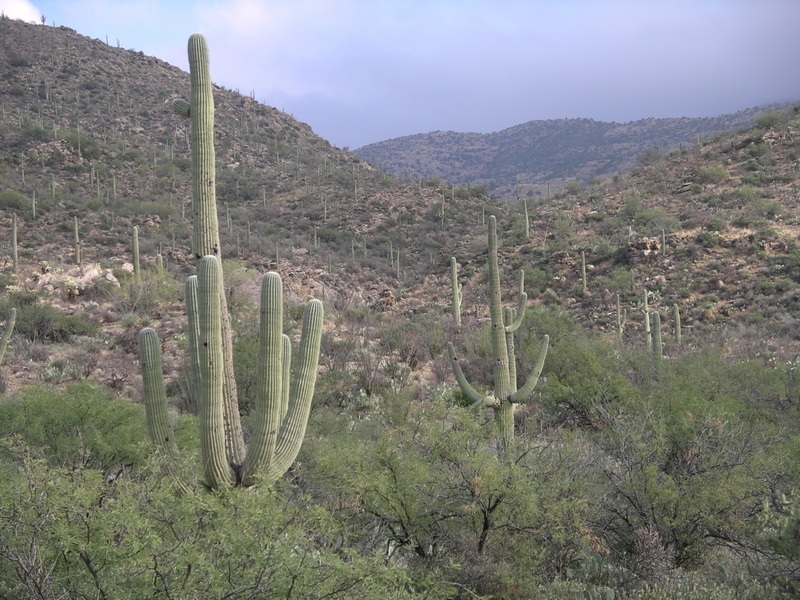 When an arm of a saguaro cactus is turned downward, it means the cactus is dying. But it can "change its mind," at which point the arm starts growing skyward again. But about solo travel...today's observations. The people who arrived here alone are more open to mixing and mingling with everyone. The people who arrived here in pairs tend to stick by one another. And I tend not to engage them as much as the solo guests. They are a set. They are self-contained. They go to meals together, go back to their rooms together, look for one another wherever they go. They're a little closed off from the rest of us. Anatomy of a solo trip, day one. Apprehension. 9:30 am, Houston. Having one of those "poor me" moments while rushing to make the connection to Tucson. Why was I going to all this trouble, flying to join a bunch of strangers at a spa? All alone. I think about home and it seems so cozy and inviting. Typical day one for me. Just have to push through it. I have traveled solo dozens of times and have never regretted it. Yet I always have these first day doubts and crankiness. I board the second flight and get absorbed in my magazines. Again, wondering who I will be spending the week with.